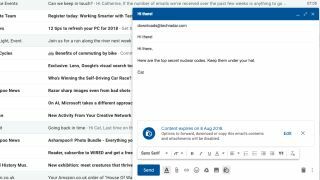 If you've opted into the recent Gmail update, two new features will soon be rolling into your inbox: Confidential Mode and Smart Compose. If you haven't already switched to the new design, here's how to do it. Confidential Mode was originally due to arrive at the same time as the overall redesign, but was delayed (for confidential reasons, presumably). Typically, if you send someone an email, it stays in their inbox indefinitely unless they choose to delete it. That's a serious problem if you've sent a piece of sensitive information and their account is compromised (by a phishing attack, for example). With Confidential Mode, the message itself is never actually transmitted to the other person. Instead, they receive a link to a version stored by Google, which expires after a set period of time (from one day to five years). For extra security, you can also require the recipient to enter a randomly generated passcode sent via SMS. To access Confidential Mode, click the clock and padlock icon when composing an email. You can send confidential messages to anyone – not just Gmail users. Smart Compose, announced earlier this week at Google I/O, is designed to speed up writing everyday emails. Like a smarter version of predictive texting on your phone, it analyzes the context of what you've typed so far and uses machine learning to suggest which word you might type next based on messages you've written before. The suggested text will appear greyed out until you tap Enter, and eventually Google hopes you'll be able to write entire messages by simply hammering one key.